Leg pain that involves a burning, shooting sensation is often chronic and can lead to difficulty walking, exercising, or moving altogether. The pain may affect one leg or both, and extend below the knee, into the foot. It’s commonly caused by spinal issues such as bulging or herniated discs that pinch and irritate the spinal nerves at their origin, causing pain that starts in the lower back or torso and radiates through the limb. Existing or new scar tissue along the nerve’s sheath can also complicate the condition, making pain intolerable. Luckily, chronic leg pain can be eased and eliminated without a long-term reliance on ineffective and addictive pain medication. Since leg pain is often a symptom of a spinal ailment or misalignment, a chiropractic approach to treatment can effectively deal with the underlying causes of leg pain. How is the cause of my leg pain diagnosed? In order to start treating your leg pain, its specific origin must be determined. Since there are numerous spinal nerves that control the legs, finding the one that is affected is the first step. Using cutting edge diagnostic tools and techniques, our team will determine where the pain originates. Our doctors will take and analyze in-office digital x-rays, creating a clear picture of your ailment. After your diagnosis, we will take you through the possible treatments you may be a candidate for, making sure you’re comfortable with each step of the process. Is Symmetry the best place to treat my leg pain? 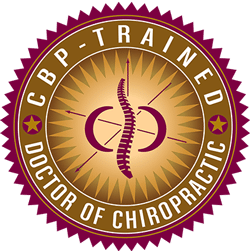 At Symmetry, the chiropractic care we provide is based on a scientifically proven and innovative approach called “Chiropractic Biophysics.” CPB uses the comprehensive and consistently advanced methods of correcting abnormal spinal structure, which often is at the root of so many ailments, leg pain included. Every chiropractic technique our staff employs involves gentle, progressive and noninvasive adjustments that help realign the spine. Spinal structure is remedied over time without undue stress, pain, and drug or surgical interventions. Corrections can be maintained permanently by following a simple exercise regimen that our staff tailors to your specific needs. Our techniques also result in improved overall health. An increased range of motion, pain response, and lessened inflammation throughout the body are some of the many benefits of our techniques, creating the heightened quality of life you deserve. Whether healing your leg pain or helping you strive for better overall health, our staff at Symmetry provides you with the best options for effective and specialized care. Please contact or visit our office in Alameda, CA so we can get you started on the road to a healthy, pain-free life.